VIRGIN RIVER GORGE – Motorists passing through the Virgin River Gorge on southbound Interstate 15 Saturday can expect delays as additional girders are delivered for the ongoing Bridge No. 6 reconstruction project. Delays are expected to begin around 7 a.m. and run through about 4 p.m. Saturday, said Sgt. John Bottoms, of the Arizona Department of Public Safety. The girders range from 90 feet to over 100 feet in length and require Arizona DPS troopers to create breaks in traffic so deliveries can be safely unloaded, Bottoms said previously. Also, with the Thanksgiving holiday next week, the Arizona Department of Transportation has set up electronic signs along the road to remind motorists to expect an hour or two of delays through the Gorge next Wednesday as holiday travel commences. Those seeking to avoid the traffic backup and construction work in the Virgin River Gorge may take Highway 91 as an alternate route. 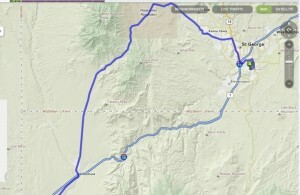 The highway bypasses the Gorge entirely, intersecting with I-15 at Exit 8 in Littlefield, Arizona, to the south and connecting to St. George at the north via Santa Clara and Sunset Boulevard. See map included in this article. Work began on Bridge No. 6 in the spring of 2014 and is anticipated to be completed in the spring of 2016. Bridge No. 6 involves a $27 million rehabilitation project replacing the bridge’s superstructure – girders, deck and railings – as well as widening the roadway through the narrow passage of the Gorge.